The above quotes from Dona. Santana (pseudonym), a mother-activist who lost her son in what has come to be known as the Cabula Massacre, and Andreia Beatriz, coordinator/militant for the React or Die Campaign, represent important starting points for theorizing state violence against Black women. This is a theme that my research directly engages. Both of these women’s narratives demonstrate that state violence penetrates intimate spaces for Black women: the body (through the womb, through the cries over the death of a child, through walking to and from various sites that signify death and violence) and the family (through no longer being able to mother a child, or young children growing up without a loved one). It is in this context that my research takes a Black feminist approach (i.) to understanding how state violence impacts Black women in intimate ways. Thus, using ethnographic approaches, I examine how Black women describe, understand, and navigate state violence, and other forms of violence in their daily lives. Further, I investigate how Black women also lead movements that connect and confront different forms of violence in their lives and communities. Five months after the Cabula massacre, I traveled to Salvador, Bahia for the second time to conduct pre-dissertation fieldwork in June 2015. During this time, I met with organizers from the React or Die Campaign as well as the mothers or partners of those who were killed in the massacre. On Friday, February 6, 2015 military police officers from RONDESP (Special Military Operations Forces (ii) raided the working class, majority Black neighborhood of Cabula in Salvador, Bahia in Brazil. The officers maintained that they entered into a gun battle with 30 men who were hoarding arms and criminal paraphernalia. However, witnesses claimed that they were unarmed. In the end, police killed 12 Black boys and young men between the ages of 16 and 27. 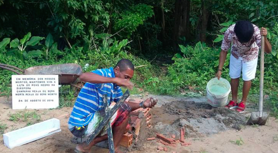 A separate investigation found that the police entered the community, rounded up the boys on a small plot of land, used as a soccer field by neighborhood youth, and executed them one by one (iii). On Monday, August 24, 2015, React or Die held its 3rd Annual (Inter)National March against the Genocide of Black People. The March represented a culmination of yearlong organizing efforts, community work, and familial support for victims killed by state violence. The march was scheduled to commence in front of the Public Security Building downtown, but early on that Monday morning, around 9 a.m. I watched over 200 people gather outside of the State University of Bahia, located in Cabula. 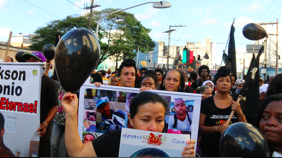 Organizers, supporters, mothers, family members, and loved ones were to walk through the streets of Cabula, to the community of Villa Moisés, where a memorial service was held for the victims of the Cabula Massacre, on the very plot of land that their lives were taken. Preparations for the memorial stone in Villa Moisés, August 24, 2015. Activists from the React or Die Campaign took these photos. I was given permission to include them in this blog post. Forming two lines, organizers, mothers, friends, and other family members walked through the street chanting, “Against the Genocide of Black People, no step back” and “We want Justice.” Upon arrival in Villa Moisés, we stopped just before descending into the community. Around us, there were many two-story townhome-like structures. Hearing the chants for Black life and the demands for justice, an older woman came out and stood on her patio, looking over the rail. At that time, one of the coordinators of the React or Die Campaign took the megaphone to greet the community members: “Good Morning Villa Moisés. We are here in memory of the dead. We are marching today for our lives. Villa Moisés will not be forgotten.” The woman who stood out on her patio responded by raising her fist in support, giving us a blessing to enter. Ricardo Matos, Presente! Júnior, Presente! Anjos, Presente! Adailton, Presente! Alessandra, Presente ! Fatima, Presente! Amarildo, Presente! Maria Vitoria, Presente! The mothers and family members who spoke are experts in their own right—they have searched for children when they were disappeared, unidentified in city morgues, or located in clandestine graves in the outskirts of the city. These Black mother activists vocalized their criticisms of governmental impunity and necropolitics throughout Brazil. They exposed the particular experiences of Black mothers, a theme explored in the literature on gendered racial violence in the Americas (v.). For me, it became clear that even in the face of government indifference and attacks, these women created a network of support and autonomous organizing, creating a grassroots organization fighting against a genocidal state responsible for the deaths of their children and thousands of others. At the end of the memorial, people gathered around a plaque in memory of victims of state violence. The memorial stone read “’We continue to live and fight for Black people in the diaspora’ Campaign React or Die!” This inscription reminded me of Patricia Hill Collins’ words: “motherhood can serve as a site where Black women express and learn the power of self-definition, the importance of valuing and respecting [themselves], the necessity of self-reliance and independence, and a belief in Black women’s empowerment.” (vi). Just like the land upon which the young people were killed in Cabula, the streets in front of the buildings were transformed into spaces of resistance against genocide. Through occupation of the streets, the courtrooms, government offices, Black women disrupted these spaces, reconfiguring them as sites for collective grieving. Their activism disrupts a narrative of “what (whose) life is worth, a narrative that says that Black life is worth less and that life itself can be valued based on race, economic status, gender, etc. (viii.) During the memorial ceremony, one of the family members said, “Their blood is not so cheap that we allow their murders.” “As we gather, we encounter our force, our power, our ability to live.” The acts of re-membering their loved ones, collective grieving and making public the pain and suffering at the hands of the state, provide a language (whether verbal, emotional, or embodied) for these women to articulate their experiences and to take political action. Organizing, activism, re/memory and grief are engaged as central, pivotal, and diasporic sites for theorizing Black politics and liberation (ix.). i. This approach draws on and contributes to scholarship that situates Black women’s organizing as key sites for the production of theory and knowledge. See for example, Cardoso, Cláudia Pons. “Amefricanizando o feminismo: o pensamento de Lélia Gonzalez.” Revista Estudos Feministas 22, no. 3 (2014): 965-986; Perry, Keisha-Khan Y. Black Women against the Land Grab. University of Minnesota Press, 2013; Smith, Christen A. “Facing the Dragon: Black Mothering, Sequelae, and Gendered Necropolitics in the Americas.” Transforming Anthropology 24, no. 1 (2016): 31-48; Collective, Combahee River. ‘A Black Feminist Statement’. na, 1982.
ii. Similar to S.W.A.T in the US. iv. Activists from the React or Die Campaign took these photos. I was given permission to include them in this blog post. v. Perry, Keisha-Khan Y. Black Women against the Land Grab; Smith, Christen A. “Facing the Dragon; Rocha, Luciane de Oliveira. “Outraged mothering: black women, racial violence, and the power of emotions in Rio de Janeiro’s African Diaspora.” PhD diss., 2014; Rocha, Luciane de Oliveira. “Black mothers’ experiences of violence in Rio de Janeiro.” Cultural Dynamics 24, no. 1 (2012): 59-73; Smith, Christen A. Afro-Paradise: Blackness, Violence, and Performance in Brazil. University of Illinois Press, 2016.; Also see the Transforming Anthropology special edition (24, no. 1) “Sorrow as Artifact: Radical Black Mothering in Times of Terror. vi. Collins, Patricia Hill. Black feminist thought: Knowledge, consciousness, and the politics of empowerment. Routledge, 2002. On May 25, CLAS will cosponsor “Grief as Resistance: Racialized State Violence and the Politics of Black Motherhood in the Americas,” a transnational conversation with Black mothers who have lost children to state violence. Mother-activists from the US, Brazil, and Colombia share their struggles and strategies of resistance against police violence, mass incarceration, and the unrelenting injustices facing Black communities around the world.